Today is the day we've been waiting for! Lil' Inkers February release is now available!! The release includes 2 new stamp sets, 2 new dies sets & 2 new individual dies. You should have arrived here from Kristen Foreman's blog. If not, head to the Lil' Inker Store Blog to start from the beginning. Today I have two Valentine cards for you. These aren't just any card either, they each have a little something extra. 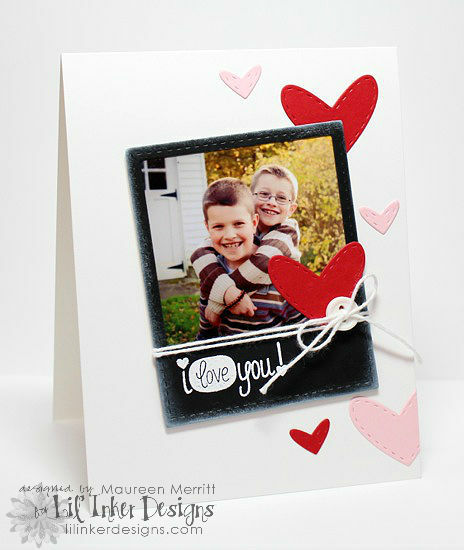 First up is a photo card using the much anticipated Stitched Hearts Dies! You KNOW you've been waiting for these. My next card is perfect for kids or teachers for Valentine's Day, or any occasion by changing the sentiment and papers. 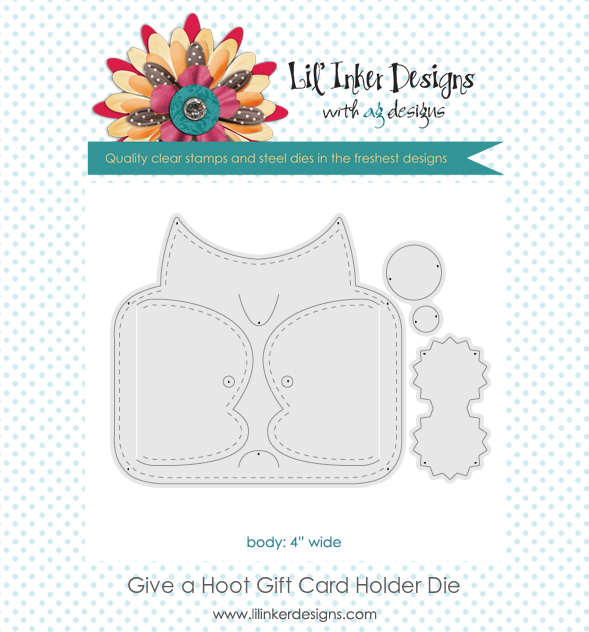 How adorable & CLEVER is this Give a Hoot Gift Card Holder? I added some Stitched Hearts to this card too and stamped the wing with the xoxo sentiment from Love Things. The Give a Hoot Gift Card Holder can be used on it's own or you can attach it to a card front (like I did here), add it too a gift bag etc! I LOVE it! Time to keep hopping along now. Next up is the talented Sarah Jay, so head over to her blog. Make sure to leave comments along the way because Laura is giving away 3 - $15 Store Credits! Your cards are both so fun! Shut up! These are so cute!!! I just can't get enough of those stitched dies. I love the background you created behind the owl. So pretty. These are so great, I think you talked me into the hearts now. Oh how sweet! Love the card with your boys...adorable! Fabulous cards...those stitched hearts are just too wonderful! Love the sweet picture of your boys! You have been pinned. The photo card is perfection. The black and white design with the colored hearts is wonderful and makes a CAS card really pop. EEEK!!! More dies I NEED!! Love both of your cards. The one for your hubby is perfect!!! absolutely love the photo card! These are super cute!! Such a fun idea for the photo card! Maureen adore both of these! Both cards are beautiful, love the picture. Adorable cards! LOVE the photo one! Both are way too sweet !!! Brilliant, Maureen! Love these cards. That first card is so super cute---love how you personalized it!!! And I absolutely ADORE that little owl gift card holder! Soooo sweet! Absolutely wonderful showcases of the new release! You're make it quite clear that these products are irresistible! 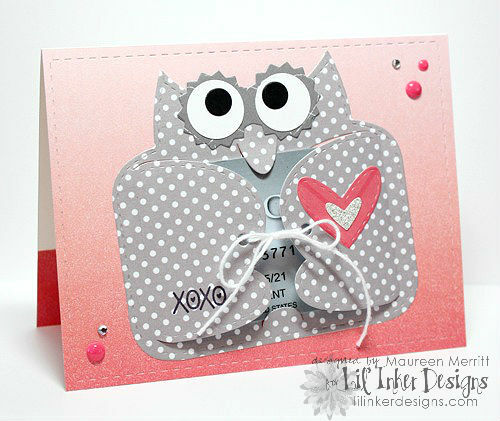 very cute photo card and love the polka dot owl. They're both great cards but I especially like the Polaroid w/ the hearts. Wonderful...love how you personalized your card with a picture. I love these new dies. This is just so sweet...what an adorable card. The owl gift card holder is just too cute. Both are fabulous! I'm sure your husband will treasure that adorable card. and that owl is so cute! This is a killer release from Lil' Inker! I must have those hearts!! Love the way you layered them on and around the photo of your handsome boys. And the owl gift card holder? Genius! Gotta love an owl who wears his heart on his sleeve! Adorable cards! I really love those hearts! 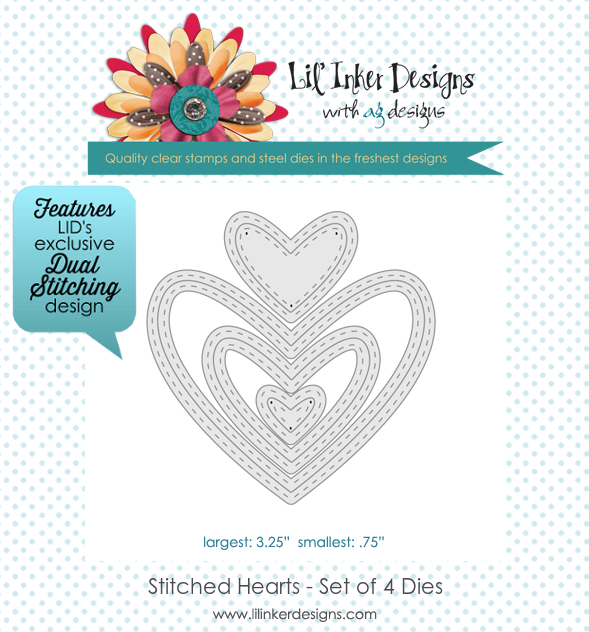 loooove thsoe stitched hearts! great photo card and your owl is A-dorable! Adorable card and the photo even better!! Love that owl. Great idea to highlight the picture with the hearts. Both projects are wonderful. Love the hearts and that cute owl!!! Basics & Beyond is LIVE! 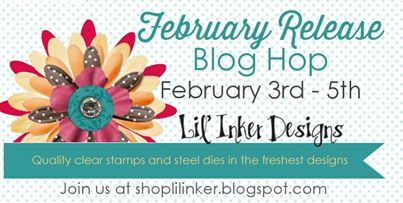 Lil' Inker- February Release Blog Hop Tomorrow!